A conservation expert and his team challenged the notion that expert help from the outside is the only way to preserve some of the world’s most valuable and unique ecosystems. Ecologist Douglas Sheil and his team started on a conservation mission in 2004. Experts in establishing relationships with remote communities, the team was sent to villages of West Papua, Indonesia by Conservation International (CI) to pave the way for the America-based NGO to come in and assess conservation needs. But after living for a while in two villages in the Mamberamo-Foja region, the team discovered something—villagers already had a protective system in place, and they were conserving the land quite well. Three years later, he went back and documented what they were doing as a case study, which he and his co-authors recently published. The study addresses a conflict Sheil has seen before: professional conservation organizations saying they need to protect unique resource-rich lands, and locals not getting credit for already protecting the land and often getting blamed for not doing it right. Papua used to shelter the largest, untouched tropical forest wilderness in the Asia-Pacific region, according to a 2010 study Sheil co-authored. New Guinea, the second largest island on Earth (the west half of which belongs to Indonesia), is home to an estimated 14,000 to 25,000 unknown plant species. Indonesia is one of the world’s most biologically diverse countries. In 1991, the Indonesian government declared the region a nature reserve in need of conservation protection, but the military Dictatorship—led by Indonesian president Suharto—wanted to plant oil palm and sold off land after very little consultation, said Sheil in a Skype conversation from Norway. But not in Mamberamo as it was too remote. “But of course those people were there when the nature reserve was declared and nobody ever asked them their views about declaring it. So in a sense it’s kind of ridiculous,” said Sheil. Today the land is still a reserve on paper, so technically there shouldn’t be people living there. But the communities do know that, probably due to Sheil’s work, and since no conservation staff has ever moved in, the communities are still the ones managing the land. In the 1990s, there was uncontrolled logging and widespread forest fires in the region, which severely shattered precious forest ecosystems. 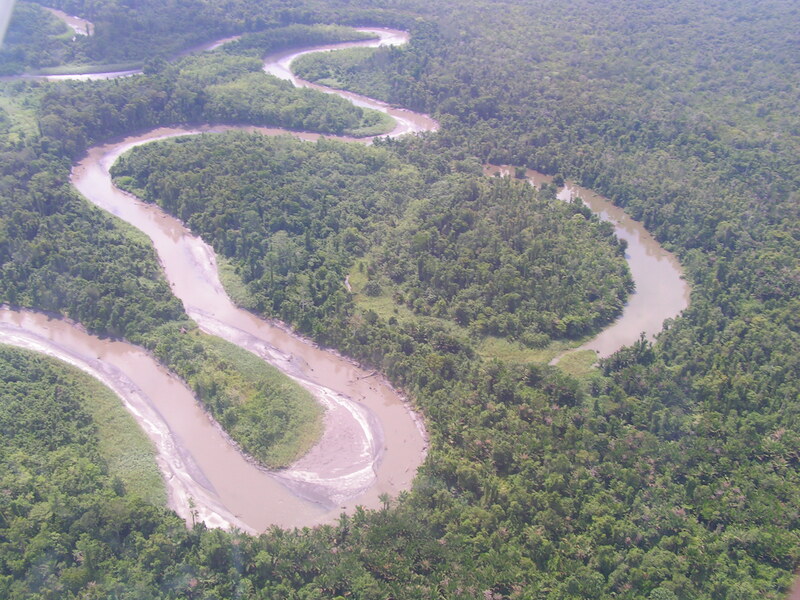 In 2000, after the fall of the Suharto dictatorship, CI wanted to go into the remote Mamberamo-Foja region and visit the sacred mountains to develop a conservation support program. The organization had initial discussions with a few communities but couldn’t work in the mountains where they thought many special species existed because the locals were distrustful and wouldn’t let them in. In 2004, Sheil and his team were hired to help. A professor at the Norwegian University of Life Sciences, Sheil was working for the non-profit Center for International Forestry Research (CIFOR) at the time. CIFOR works to help decision-makers and communities determine how best to conserve forests and landscapes. 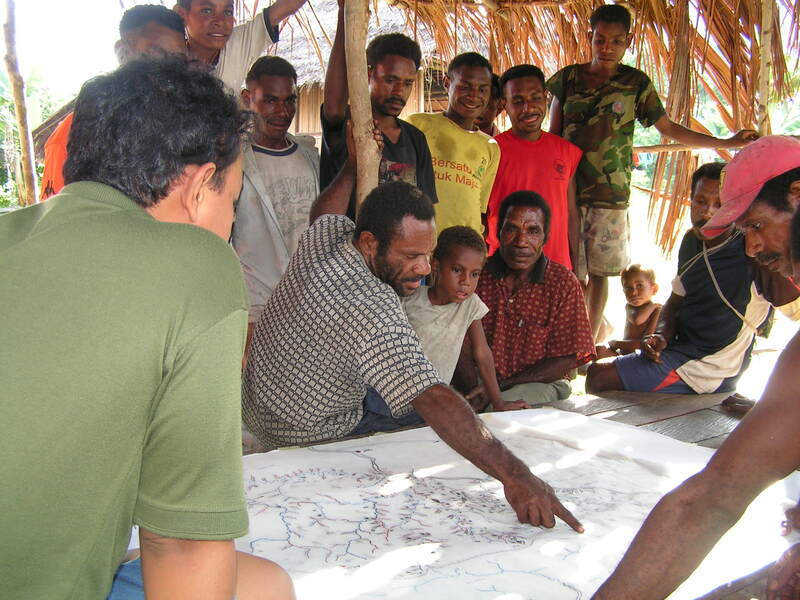 Sheil had led several expeditions in other countries for CIFOR and was often the spokesperson called on to establish relationships with remote communities. He went in with a team of 25, which included Papua students to help with building trust. They spent several weeks without running water, sleeping in huts on floors made from loose branches, and many of his team caught malaria despite taking antimalarial medication. Over time, he said, these naturally kind and generous people warm up to outsiders, and he can genuinely make friends. By the end, they were able to get the permission for CI. Sheil explained what happened next: “CI’s team of biologists went in and discovered lots of new species and made a lot of publicity out of that,” he said. He recalled some news articles at the time suggesting that communities would exploit the resources and kill all the birds of paradise for profit. These “new” species weren’t new to the local people of course, who were already taking care of the land without outside help. For these groups of people, their land is very much their identity. In his experience, forest inhabitants are very much in tune with their land ownership obligations, said Sheil. “For these groups of people, their land is very much their identity … There’s no question this belongs to their ancestors, this belongs to their great grandchildren,” he said. At first, Sheil recalled he felt intimidated by the defensive stance of the locals. They didn’t hesitate to tell him how previous people had tricked them. “The people in Papua don’t really like what’s happening to them,” he said, and since the central government views them as “very primitive” they don’t get much support. “There’s a huge kind of rift,” he said, between the sophisticated Javanese people and the Papuas “who don’t dress.” This has resulted in a lot of conflict. Sheil has seen this conflict many times between conservationists and the local people. “The conservation authorities are like an embattled military trying to protect a certain tract of land or animals from these predatory communities,” he said, recalling experiences in Africa. The communities “get blamed,” he added. After his first stay, Sheil wanted to go back and learn more. 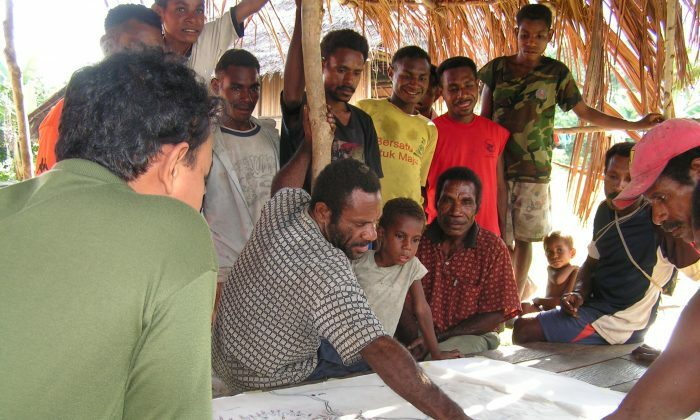 In 2007, Sheil and colleague Manuel Boissiere took a smaller team to the Mamberamo-Foja region to conduct his own study of on-the-ground environmental monitoring activities that he noted in 2004. The team selected three communities, which encompassed 3,000 square kilometers (1,158 sq. miles) and studied their threat and resource monitoring tactics. After group discussions, surveys, and individual interviews, among other methods, the team learned that all of the communities used diverse methods and that autonomous monitoring was an integral part of people’s lives and cultures. For example, in Metaweja, people shared the responsibility of protecting the territory—paying attention to boundaries with mistrusted communities. Some households camped at strategic locations and the men reported the frequency of their visits to different portions of their territorial boundaries, looking for signs of trouble. The frequency increased according to both accessibility and level of distrust with the neighboring community. Monitoring is a major theme in resource management and conservation and it requires recognizing and responding to constant changes—something lacking among authorities, the report states. 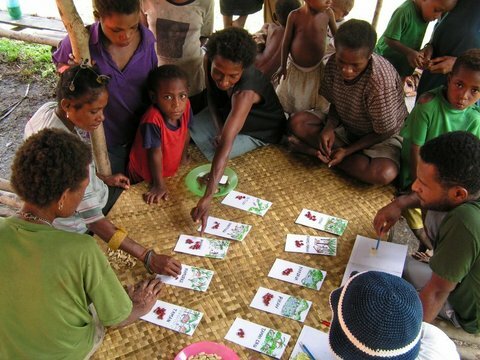 But in the Papua communities, observation and response were closely linked and their monitoring activities were effective at protecting the environment and deterring unregulated exploitation. Despite having a robust system for land stewardship, the local populations now face new threats they are much less prepared to handle, such as government plans for restoring biodiversity and the ongoing development activities. One plan is to dam the valley where the villages are located, which would flood a lot of the land. Decisions like this are made on a “very high political level” and not always shared with the local people, although land rights issues are now being treated more democratically, said Sheil. With these threats, the communities’ systems of monitoring are limited. At the same time, they haven’t been afraid to protect the land when they need to. 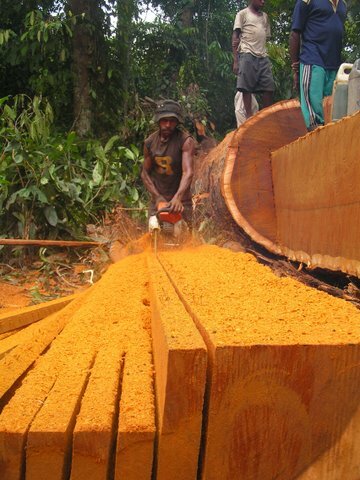 In one instance, when he was in Kalimantan, Indonesian Borneo, a company began to cut timber near a series of caves they had agreed to stay away from. The villagers forcibly confiscated the company’s vehicles and heavy machinery. Sheil said they don’t hurt anyone, but the community refused to return the equipment until a penalty was paid. From Sheil’s perspective, biologists and conservation professionals have long-overlooked local methods of protection. And now, communities can’t identify all the threats due to lack of governmental transparency, which increases the burden on conservation authorities. For now, the dam project has not gone forward. But there is rapid change in the lowlands with logging and development in neighboring lands and these communities see that. “People have always had the experience of seeing other communities where it hasn’t gone well,” he said. Sheil says these communities will give their consent for development that they want, but will reject development that threatens to take over their land. The important thing to note is these kinds of stories occur in other countries through other agencies’ efforts, he said. “Conservation International was smart to realize they needed the help and trust of local communities and the local government has become much more sensitive to local needs and concerns,” he added. The news is full of announcements about newly discovered forms of life.